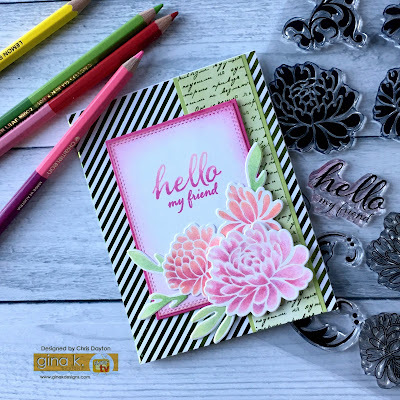 The Cast and Crew for Gina K Designs welcomes you to another fantastic blog hop celebrating the new Sentimental Summer StampTV Kit. Today, the Cast & Crew has prepared some amazing and beautiful projects to share with you! Join us by hopping along on all of the Cast & Crew blogs to see the wide variety of samples. These will give you ideas as you create your own projects when you receive the set for yourself. Make sure to leave a comment on the blogs because we will be giving away a prize! 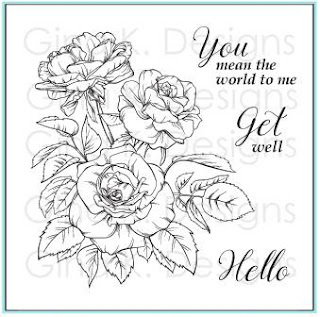 I used the solid stylized peony stamps for this card. I stamped them in Innocent Pink and Peach Bellini inks, then added Chameleon colored pencil to create a slight 3D look. I die cut them and the leaves and added to my card base which was layered with a pieces of the fabulous new black and white patterned papers, each foiled with Jelly Bean Green Fancy Foil. My sentiment was added with as ombre stamping technique with Innocent Pink and Passionate Pink ink. I just love the foilable black and white Petite Patterns papers! They give you so many options. 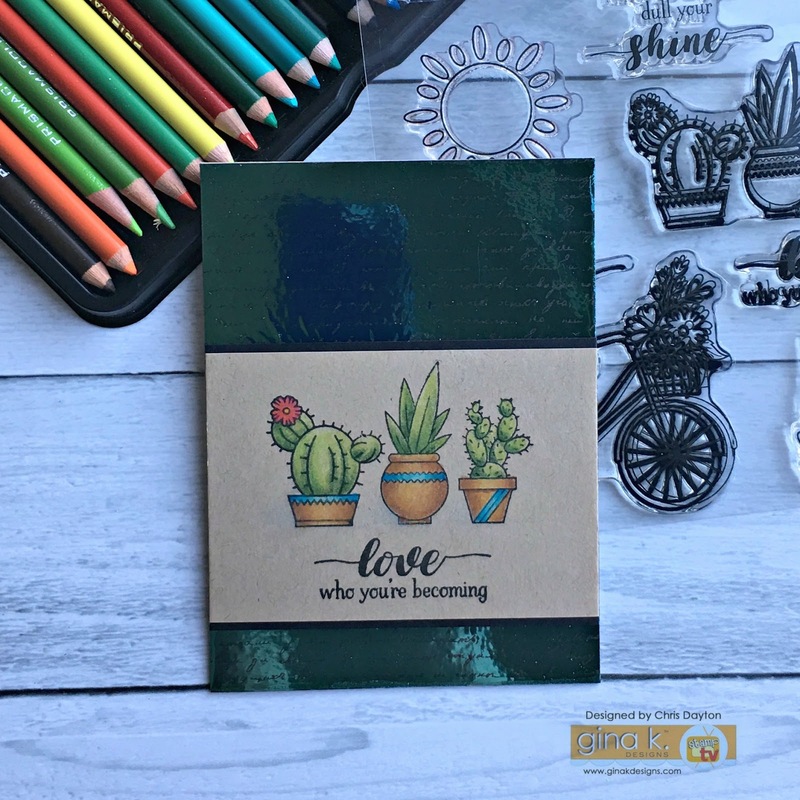 These adorable little pots of succulents were colored on Kraft cardstock with Prismacolor pencils. The background is made with the negative of foil from the scripty patterned paper. I used Elmer's spray adhesive to attach it to my black card base. 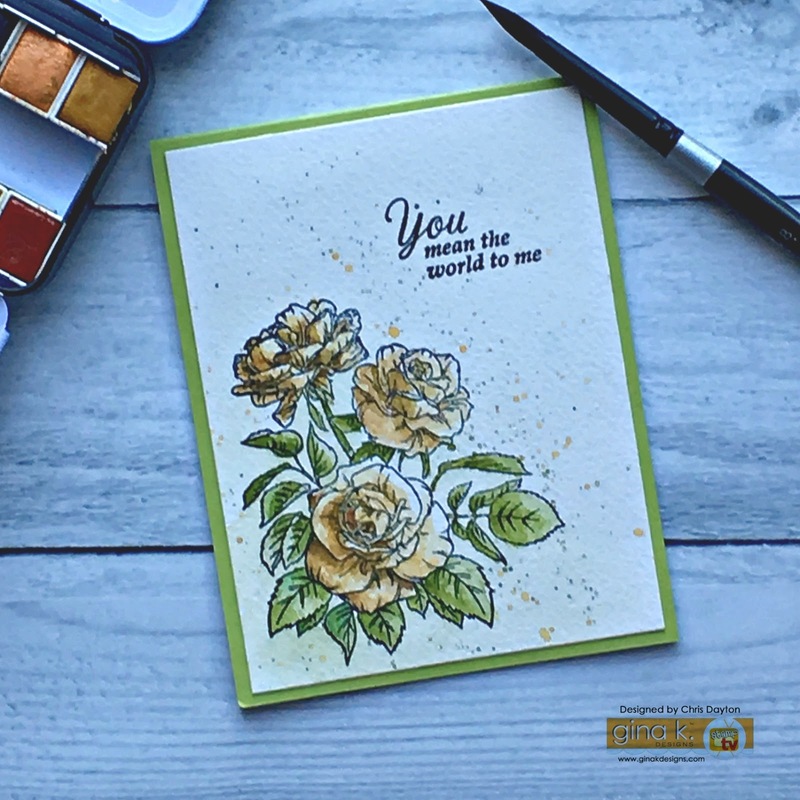 This square card is watercolored with Prima Confections watercolor. My watercolored panel is attached to a Turquoise Sea card base and the black gingham ribbon is simply knotted around the card front. This is the current June incentive set! Isn't it lovely? It's yours free with a $75 purchase! I stamped the images with Versafine Onyx Black Ink onto 140# cold press watercolor paper and watercolored the roses using Prima Confections watercolors. I cut a very simple and rough mask from copy paper, then used the mask to cover the roses then spattered the same colors to the background. Clever ideas...will want to case them! These are great cards! thank you for the inspiration. GORGEOUS cards! 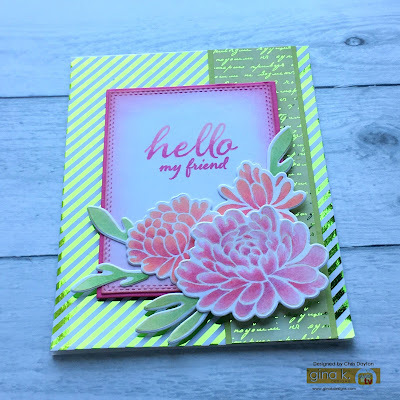 The use of the negative with the foil looks amazing and the images with this kit is so fun! I love all of these - I tried to pick a favorite, but it was impossible! Chris....once again your work is simply amazing!!!! Black and pink is so elegant. Thanks for the tip on the glue for the negative from foiling. I had wondered what people used to tack down onto paper. Your watercoloring is beautiful. Love those roses. Beautiful! I love everything, especially the black and white striped paper. Love all your cards! I just couldn't pick a favorite. Beautiful absolutely beautiful! Love all your cards. Can't wait to try negative foiling. love the succulents and the bike!.. nice work! What lovely cards! You always inspire me. Wow - those are just glorious cards! I so love the dahlia stamp set, but I am starting to really like the other set as well. OMG so much wonderful inspiration here. Your cards are awesome. Love how you did the rose bouquet. Chris, all I can say is wow, what amazing ideas! Thanks. I especially love your first card...very inspiring! Gorgeous cards. Love the watercoloring! Love all your cards! Beautiful work! Hard to pick a favorite! Loving this blog hop with all of it's talent and inspiration! Thanks for sharing yours! Beautiful cards! Love colored pencils and watercolor. Thanks for the inspiration. Awesome cards! I admire your use of color and your designs. I love this stamp tv kit! Beautiful cards and I just love that bicycle. Great cards! Great sets!! Beautiful!!! OMG such great coloring, wow! Your cards are all very pretty! 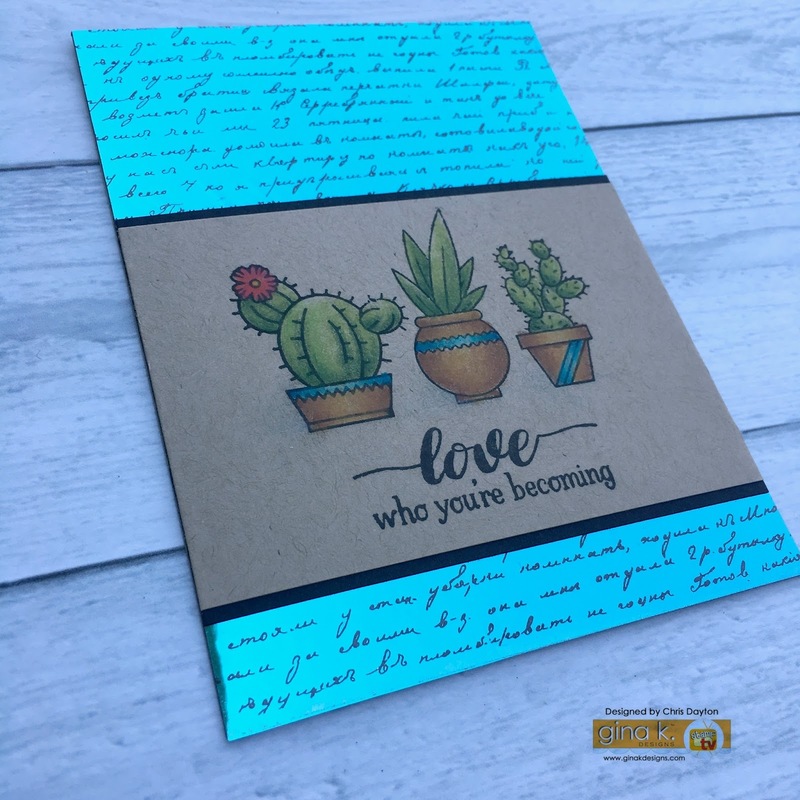 Love these examples, especially the cactus and your use of the foil after using it with the script paper. the cactus with negative foil is perfect! Beautiful cards, I especially love that first one! I to am in love with the papers and the fact that you can foil them!!! Lovely cards. I like your coloring and choice of papers. All are so very beautiful and I just love that the pattern paper is foilable too! Wow! Your cards are beautiful! Thanks for sharing! Beautiful cards. I always love your coloring. Your cards are all gorgeous! This Sentimental Summer kit looks like so much fun. Thanks so much for all the great inspiration, all your cards are stunning but there is something about that bicycle..... it just makes me happy!!!! Great job! Ooh, love how you've used this set! 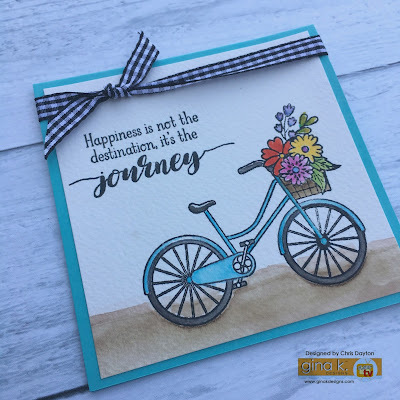 I tend to gravitate to flower stamps and your cards are beautiful, but there's something about that bicycle that is so cute! 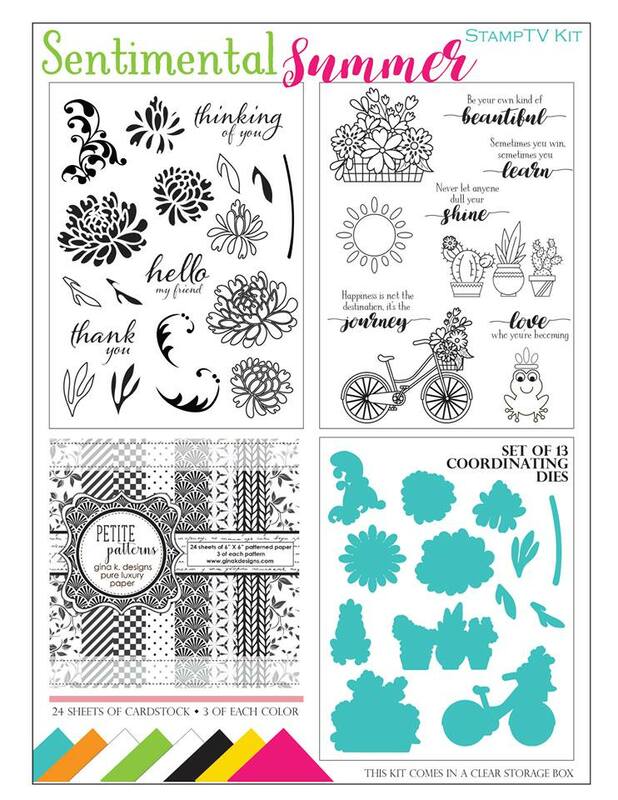 I am madly in love with these flower stamps, they are gorgeous. Your cards are beautiful! I love the bike, too! the cactus garden is sweet. Your cards are all beautiful! I like this month's kit. Love them all, esp the backgrounds!!! Chris your cards are gorgeous! 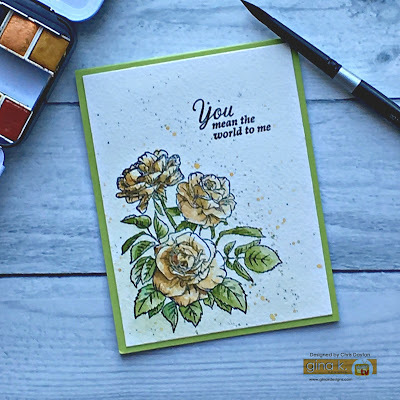 Love your coloring, you always do a beautiful job on your cards...such a talented person! Your cards are simply beautiful! I really love the rose one. Thanks for the inspiration. Just beautiful! I think you really did the rose beautifully! Absolutely beautiful! 🤗 Love Gina K Designs! Your cards are beautiful! Thanks for the inspiration. I'm loving this kit!!! Beautiful cards and I almost forgot that the patterned paper pack can be foiled...awesome. Fantastic cards. I can't wait to foil my fanny off. I'm not a succulent kind of girl, but absolutely LOVE these little cacti! Love the way you colored them. Those yellow roses are perfect! I'm just crazy about this release!!!! 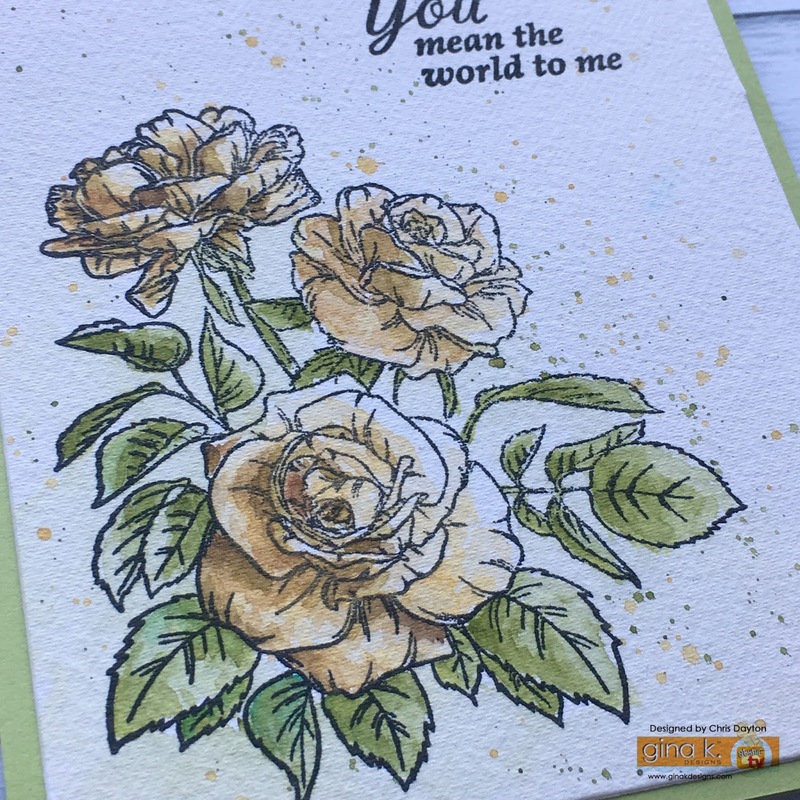 Just love that rose card, and the dimension you added to the dailies with pencil! I really love the coloring you've done on the peonies! Beautiful! I seriously need a chin guard, because my jaw is always dropping at your creations! Just stunning, beautiful...wow! Love this kit and your coloring is amazing! Beautiful cards, Chris! Can't pick a favorite...love them all! I love your cards, Chris! The first one is absolutely stunning. I love your choice of colors...beautiful cards! Thank you for sharing. Absolutely beautiful cards-the colors are wonderful! Beautiful cards. I am a sucker for stripes, so the first one jumped out and ON me - I am definitely going to CASE that one. Thanks for sharing. I just love the first cards. It is so pretty. 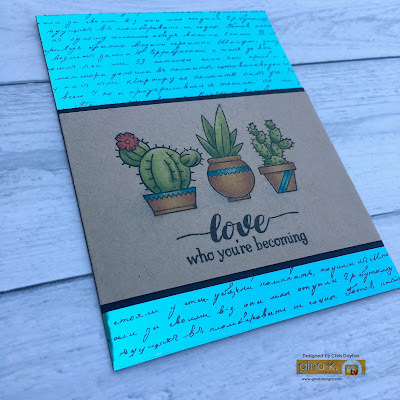 What a lovely combination on the first card, with the script and stripe background! I must try that. Those cards are all beautiful. I love your creativity. I love the foiling with the scripty paper... So beautiful! In love with it all and the cards created. Kraft and pencils were perfect choice for those little pits. Thanks for the copy machine mask tip. So much faster than what I have done in the past. I love splatters, but hated masking. Oh love your cards. I got my kit yesterday and hope to get to play today. I didn't know about the incentive stamp or I would have had that too. My favorite are the flowers of course. thanks for the inspiration. Love them all!! Simply sweet cards - thank you! Makes my heart smile. Great cards. Love how you did the incentive stamp set card. This is a wonderful kit and your cards were created beautifully. Wow, gorgeous cards. Thanks for sharing with us and inspiring us. Awesome kit and awesome cards. love your work Chris. WOW, your cards are gorgeous. I really love the splatter too! Awesome cards! Love the beautiful flowers and the bike with the basket of flowers! Love, love, love the cacti card. love all the cards, the bicycle is so sweet! Lovely samples. I love your version of the rose garden stamp. Beautiful cards! I especially love the card with the diagonal stripes and the one with the negative piece of foil -- I will have to remember that one!